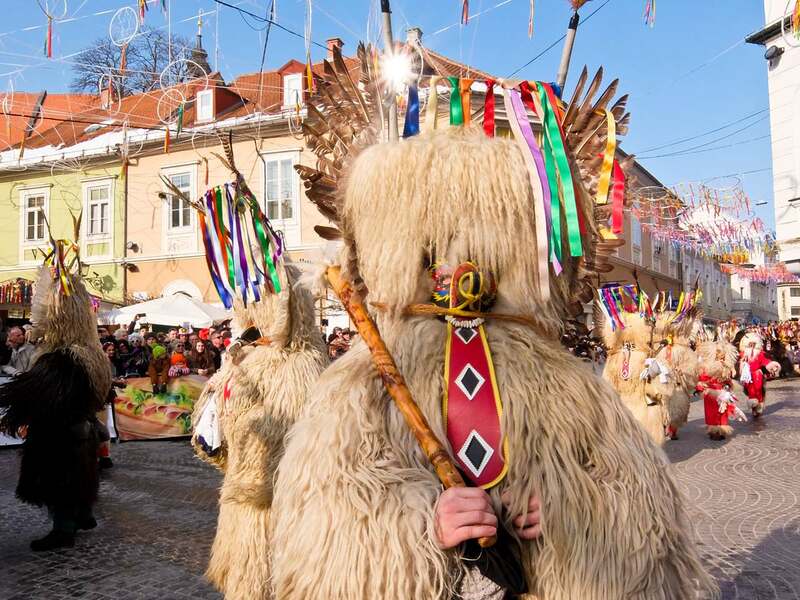 The Kurentovanje, or Kurent Festival, is one of the world’s top ten carnivals and kicks out winter and welcomes spring. 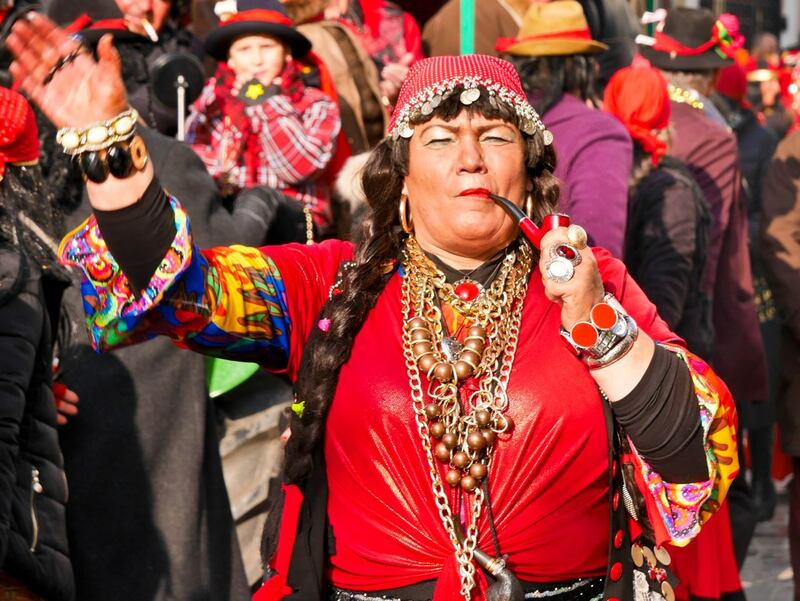 It’s the Slovenian version of Mardi Gras. The city of Ptuj is the oldest settlement in Slovenia. 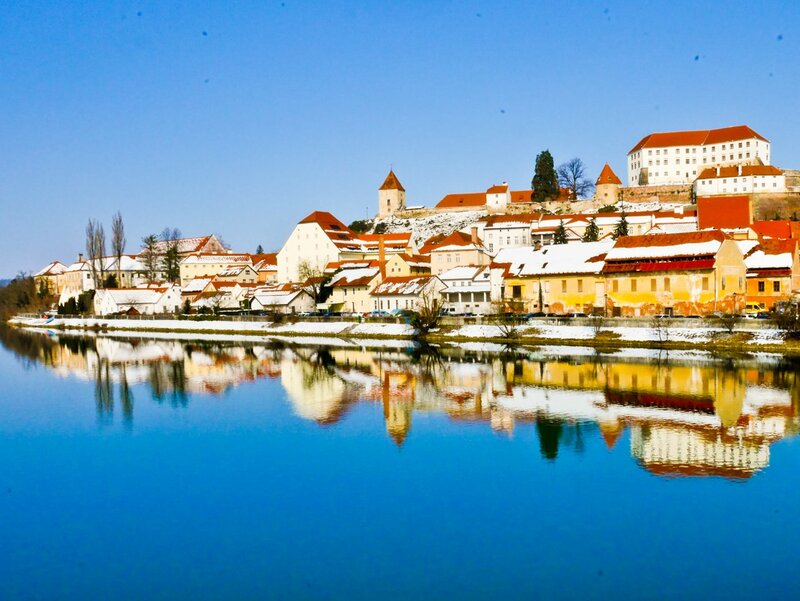 It sits on the banks of the River Drava, dominated by its medieval castle. In Roman times it had a population of over 40,000, twice what is now, but it gradually diminished during centuries of Hapsburg rule. Still, the old town is delightful with cobbled streets home to Churches, Monasteries and pastel coloured restaurants and cafes. What is the Kurent Festival? 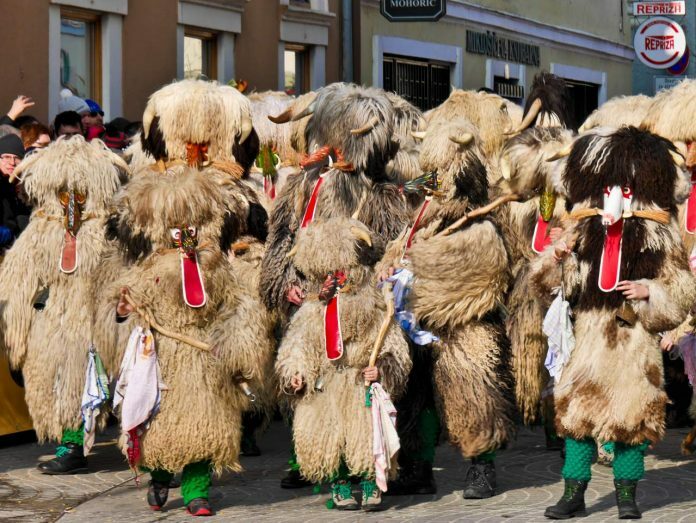 The Kurentovanje, or Kurent Festival, is one of the world’s top ten carnivals and kicks out winter and welcomes spring. 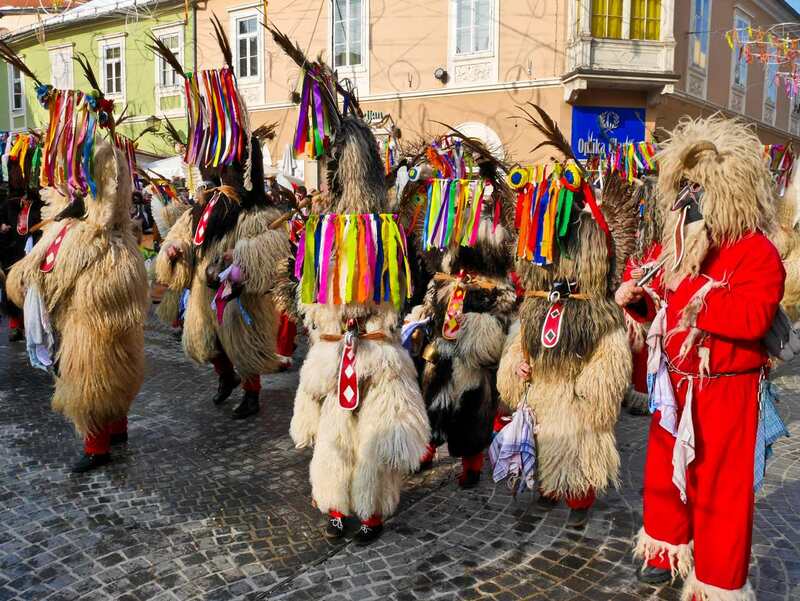 It’s the Slovenian version of Mardi Gras and has its origins long before the Romans, in the distant mists of Celtic times. It fell out of favour but was revived in 1960 in an attempt to keep the traditions alive. It certainly worked. 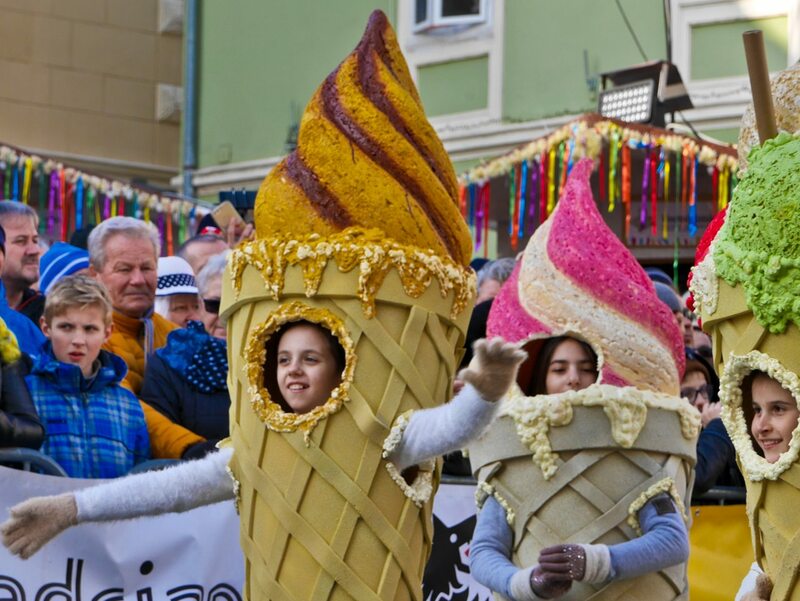 The event spans the ten days before Shrove Tuesday and attracted many thousands of visitors. In 2017 UNESCO inscribed it on their list of Intangible Cultural Heritage of Humanity. Sunday afternoon sees the International Carnival Parade which involves more than 2500 participants and I take my place in front of the ornate town hall, where a band is playing Slovenian folk music. VIP’s sitting in the stand include the Slovenian Prime Minister. We wait patiently for the parade to begin. 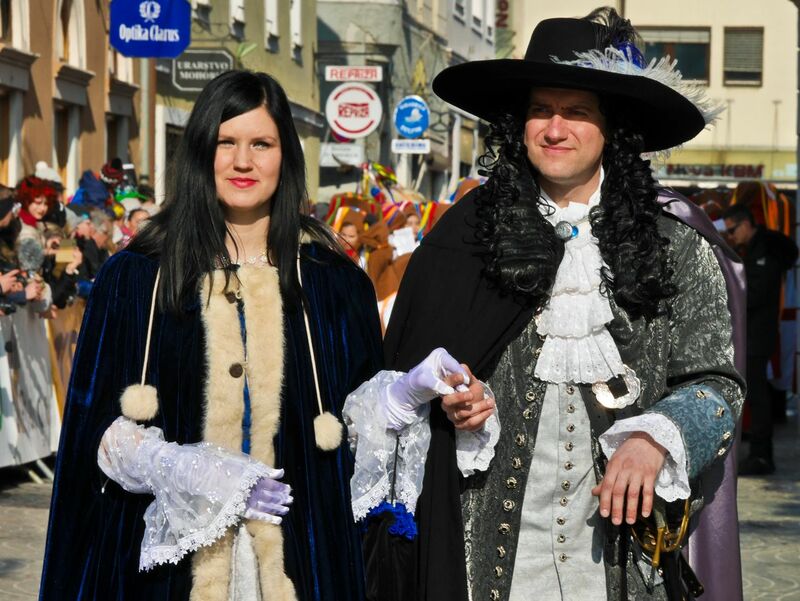 The Parade is led by the prince of the carnival with his princess, surrounded by guards dressed in 17th century blue and grey. Behind them is a marching band in crusader costumes, mainly young girls. Next comes a group of men in red tunics, blue aprons and black hats, decorated with flowers. They pause in front of the town hall and their guards crack their whips, frightening the crowd. 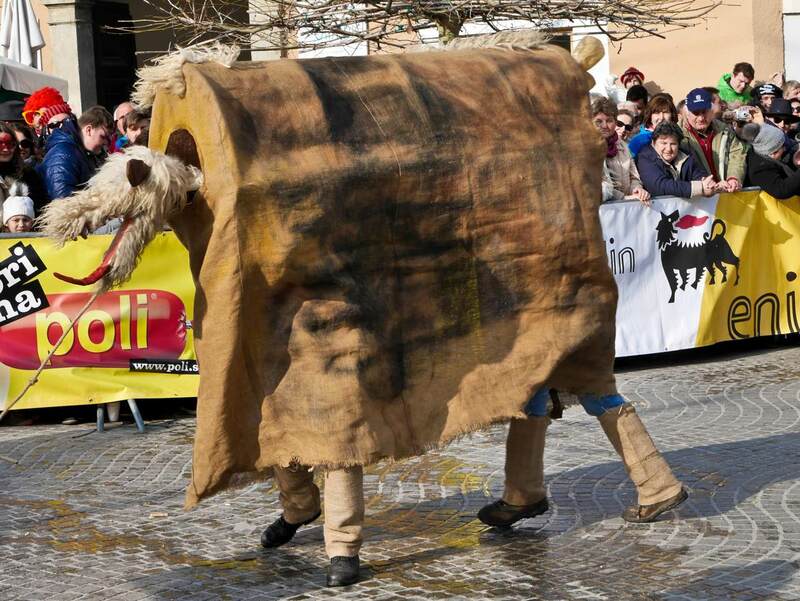 Following them are tractors full of smoking gypsies, foresters hauling logs, spearmen tossing their ribbon covered spears in the air and a troupe of pantomime horses, known as Rusa. Each is operated by two men and create a bit of stir by spraying the prime minister with water, much to the disquiet of his body guards. Still this is carnival and there’s nothing they can do about it. What we’ve come to see are the Kurenti and suddenly there are hundreds of them, lopsidedly twirling, like spinning tops gone wrong. 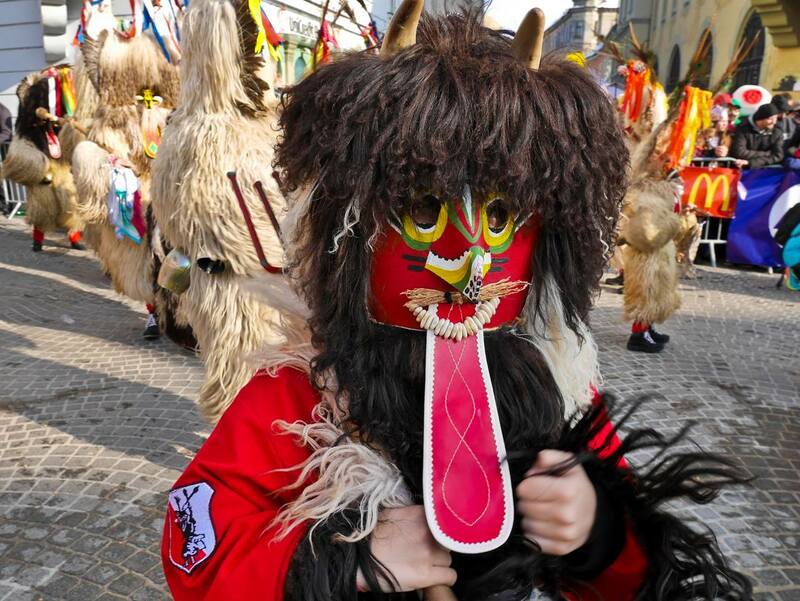 Each Kurent has a coat of shaggy sheepskins, topped with an ornate mask, and wears five large cowbells around his waist. Ears are made of bird wings, adorned with ribbons, the nose is elongated and the moustache is made of maize. White beans, threaded on a string, serve as teeth and a long red tongue of red cloth or leather spills down the front. Heavy boots and red or green leggings complete the ensemble and they brandish a long stave, studded with hedgehog spikes, to drive the devil forward. Each group of Kurents has at least one of these, standing out in their bright red costume. As they dance, the cow bells make an enormous din, momentarily silenced as they pause and form a circle, expanding and contracting. Some Kurents break off and approach the crowd, begging young girls for handkerchiefs to be added to their clubs. You certainly don’t want to mess with them as the masks turn them into shaggy giants and they’re certainly a force to be reckoned with. After the Kurents have passed it’s the turn of the international troupes. Macedonia has the Meckari, the Czech Republic brings Mystique, France has the intriguing Mülhüser Waggis and the Sitnan are from Slovakia, without forgetting Rain Dance from Macedonia. 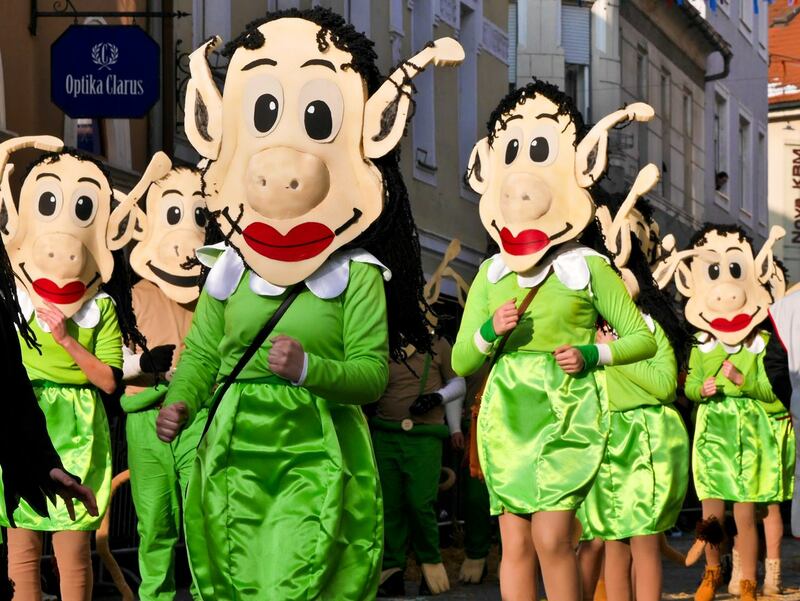 Serbia has the Cheerful Ice-creams, the Happy Blossoms and Bullfighters and Belgium brings the Sangliers d’Arlon, all dressed in boar skins. After the procession is over, I see Kurents all over town, outside the bars, with their heads bared. It’s thirsty work dancing through the streets and you certainly can’t drink beer whilst wearing your mask. I repair to the Kobel Cellars as the region close to Ptuj produces some of the best wine in Slovenia. Bojan Kobel leads me through a tasting of his best vintages and tells me that the wine tradition is almost as old as the festival. There’s been uninterrupted wine production since Roman times and, unlike the Kurentovanje, you don’t need to wear fancy dress to take part. 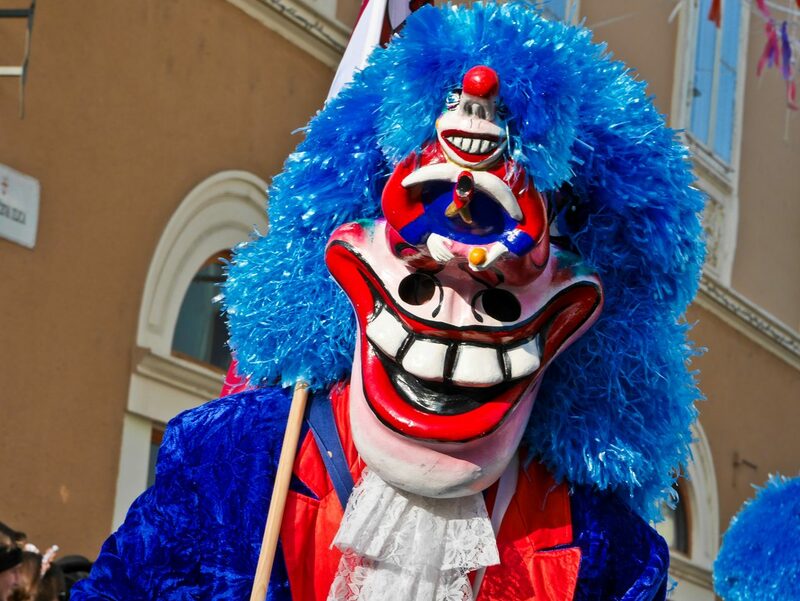 Kurentovanje has information about the carnival and the next one will take place in 2019. Ptuj has information about the town. I Feel Slovenia has information about the country. We flew Wizz Air direct from London Luton to Ljubljana. The Grand Hotel Primus in Ptuj makes a good base and has thermal baths.